The RS-24 Yars intercontinental ballistic missile is a MIRVed version of the Topol-M with the payload modified to carry up to 10 MIRVs each containing a thermonuclear warhead weighing 300 kilotons. The Yars is 3 staged, solid-fueled and can be launched from a silo or mobile launcher. Like its predecessor the Topol-M, the Yars is designed to evade missile defense systems and is becoming a foundational part of the Russian Strategic Missile Forces (RSMF) with an estimated 80% of Russia’s ground-based missile force being made up of Topol-M and Yars missiles by 2016. Since its introduction in 2010, when the first road-mobile Yars was deployed at Teykovo, the Yars has replaced SS-19 missiles at the 28th Missile Guards Division at Kozelsk, and is deployed at Novosibirsk and Tagil. Russia also continues to retire old SS-18, SS-19, and SS-25 missiles replacing them with the Yars or deactivating silos and garrisons. 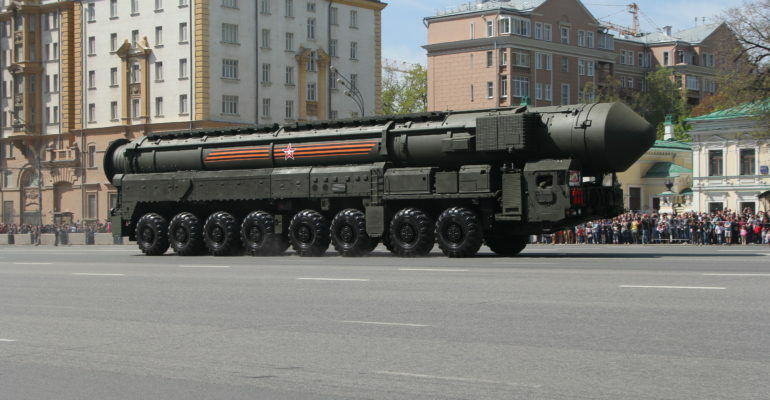 The RS-24 Yars has been at the forefront of Russian efforts to modernize its nuclear forces. The Yars gives the ground based element of Russia’s Nuclear Triad increased effectiveness through its ability to evade missile defense systems. The missile has the capability to maneuver during flight and deploy both active and passive decoys which gives Yars the advantage against modern missile defense systems. The RS-24 is Road-mobile and can deploy in retired Russian missile silos making the missile more difficult to detect. This coupled with the fact that the Yars only takes 7 minutes to launch poses serious threats to the missile defense system used by the US to protect its homeland and its allies. The RS-24 is a vital part of Moscow’s effort to increase the survivability its nuclear forces and to counter missile defense systems being deployed by the United States. The Yars ICBM is expected to stay a vital part of Russia’s Nuclear Forces for the next 20 years.